Nothing really represents winter better than a snowflake, unless of course you live in a place that get's no snow. However, since we really can't put cold air in a sweater, nor would we want it if it could be done, we figured this perfectly beautiful, rhinestone snowflake adorned to this stunningly adorable dog sweater will have to suffice. 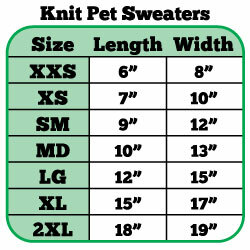 Already you can imagine how cute your dog will look in this winter knit dog sweater. We think so too, as this is certainly a favorite. Hurry and get one while supplies last. Purchase A Mirage Snowflake Knit Dog Sweater Now!